United Nations — The IPCC report says that it is not impossible to limit climate change to 1.5͒C? Do you think we can realistically achieve that? Politically, what needs to happen? History shows that when the human race decides to pursue a challenging goal, we can achieve great things. From ridding the world of smallpox to prohibiting slavery and other ancient abuses through the Universal Declaration of Human Rights, we have proven that by joining together we can create a better world. Today, I believe we can succeed in limiting climate change to 1.5°C - but only if we once again work in solidarity with a powerful unity of purpose. Humans have evolved to respond to immediate threats and opportunities. We find it more difficult to address problems that play out over years and decades. We must overcome this natural short-sightedness and commit to urgent climate action. The Paris Agreement confirms the political commitment to climate action, and the UN system provides a platform for international collaboration. What we need now is for more leaders and more citizens to recognize climate action as a global priority and to start working together more urgently. There was a great surge of enthusiasm for action among industries, governments and even regular people after Paris. Do you think that enthusiasm has been sustained and how can their involvement be ramped up? There is no quick fix for climate change. Effective climate action will require a long-term, full-time commitment by virtually everyone. Every climate policy, every new technology, every personal action that contributes to reducing emissions and building resilience should be recognized and applauded. There will be other surges of excitement, as in 2015 when the Paris Agreement was adopted, but most importantly we need to rely on consistent, steady action. We can sustain enthusiasm by sharing success stories, closely monitoring and publicizing emissions levels and climate trends, and keeping the climate conversation alive on a daily basis. Climate change is, in many respects, the quintessential multilateral issue. What needs to happen to strengthen multilateralism to tackle climate change? Climate change is a global phenomenon that requires global solutions. Fortunately, we already have platforms for multilateral action such as the United Nations and forums such as the G20. Meanwhile, thanks to the media and to rapid communications, people are increasingly aware of what is happening in other parts of the world. They see how migration, trade and technology are making us more interdependent than ever before. Although we do see a backlash against global integration in some parts of the world today, I am convinced that the sense of international solidarity will only grow in the years to come. An increasing awareness that we have a shared destiny on this fragile planet will help to strengthen inclusive multilateral action in the years to come. How do we get people and governments to move beyond commitments to concrete actions? Governments need to translate the multilateral goals of the Paris Agreement into specific policies. These policies must to reflect national circumstances and priorities. They need to create what we call an "enabling environment" that motivates and rewards companies, communities and individuals to take concrete actions. Through the Paris Agreement we will monitor national and global emissions trends to determine which national policies seem to be working and which need to be reviewed. So in sum we must build on the broad political commitment set out in Paris to craft national policies that encourage and recognize concrete measures by the full range of actors. We are all responsible for emitting greenhouse gases, so we all have a role - whether in our work, or in our personal lives - in taking concrete actions to reduce emissions. There are many success stories in all regions and all sectors that demonstrate the enormous potential of climate action. To start with, a growing number of cities and regions have adopted targets to achieve zero net emissions between 2020 and 2050. These targets are often developed in collaboration. Just one example: Nineteen city leaders from the C40 coalition signed the Net Zero Carbon Buildings Declaration to ensure that all new buildings operate with a neutral carbon footprint by 2030. The rise of inclusive multilateralism, where not only national governments but local and regional governments as well as a diverse array of associations and organizations work closely together, is a powerful force for climate action. Collaboration is also taking place among actors in particular economic sectors. Earlier this year, the global transport sector, which is responsible for some 14 per cent of global greenhouse gas emissions, created the Transport Decarbonisation Alliance. The Alliance recognizes that lowering transport emissions will also help to reduce urban pollution and improve public health. Transport companies and managers are creating innovative solutions, including new materials and designs, the increased use of renewable energy, improved public transport systems, and more efficient management of road, air and other transport networks. Building collaboration within a sector is a great way to raise ambition and to share success stories and best practices. We also see a growing list of individual corporations adopting emissions targets. Many have signed up to a Science Based Target to ensure that they are in line with the 1.5-2°C temperature limit enshrined under the Paris Climate Change Agreement. To date, over 700 leading businesses around the world have made strategic climate commitments through the We Mean Business coalition's Take Action campaign. There are so many more inspiring examples from a wide range of actors. Their efforts, more than anything else, is what gives me hope that we can achieve the objectives of the Paris Agreement and minimize global climate change and its risks. Their stories should inspire all of us to contribute more energetically to climate action. *Originally published by the SDG Media Compact which was launched by the United Nations in September 2018 in collaboration with over 30 founding media organizations - encompassing more than 100 media and entertainment outlets. The SDG Media Compact seeks to inspire media and entertainment companies around the world to leverage their resources and creative talent to advance the Sustainable Development Goals. 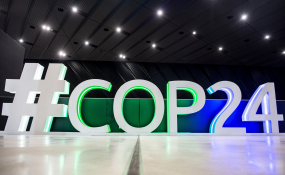 World leaders are meeting at the Climate Conference (COP24) in Katowice, Poland, 2 to 14 December, to finalize the rulebook to implement the 2015 landmark Paris Agreement on climate change. In the agreement, countries committed to take action to limit global warming to well under 2°C this century. At the conference in Poland, the UN will invite people to voice their views and launch a campaign to encourage every day climate action. Read the original article on IPS. Copyright © 2018 Inter Press Service. All rights reserved. Distributed by AllAfrica Global Media (allAfrica.com). To contact the copyright holder directly for corrections — or for permission to republish or make other authorized use of this material, click here. Africa: Religion & Development - an Enhanced Approach or a Transaction?